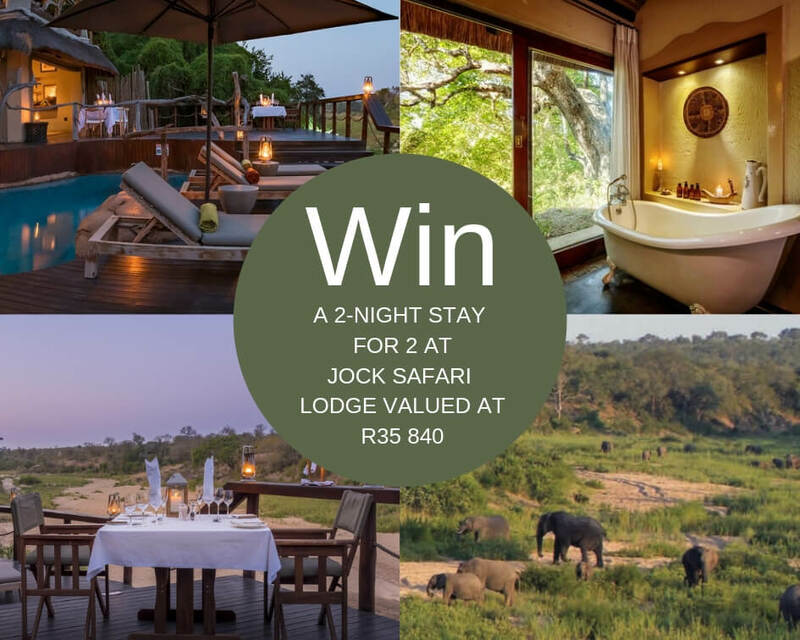 One lucky Travel Ideas reader will win a 2-night stay for two at Jock Safari Lodge in The Kruger National Park, inclusive of all meals and a selection of house beverages, daily game drives and guided wilderness walks, valued at R35,840! Situated in the south-western corner of the Kruger National Park, Jock Safari Lodge is named after local legend, Jock of the Bushveld, the canine hero of Sir Percy Fitzpatrick’s famous story of courage and loyalty that is set during the first gold rush era. 6,000 hectares of exclusive traversing rights provide excellent Big Five game viewing. Activities include daily game drives, wilderness walks and visits to rock art sites, bird watching, spa treatments, and stargazing, as well as a Kids on Safari programme for children. In the main lodge, 12 secluded thatched suites each come with an extensive private deck, an outdoor Victorian bath, and shower, as well as a plunge pool and an enclosed sala (day bed) for daydreaming and sleep-outs. With brand new interiors, Fitzpatrick’s boasts a communal lounge, spacious indoor and outdoor dining areas and a deck with a swimming pool, as well as a new TV lounge. The redesign includes an enclosed family unit with two luxury suites and bathrooms, leading to a private lounge area, deck and plunge pool with views across the river bed, whilst separately located, the third suite is also completely private, with its own plunge pool and deck with views across the wilderness. Answer the following question: Who is Jock Safari Lodge named after? Competition ends 30 May 2019. Winners will be selected from social media and email entries, announced on social media and contacted telephonically. T&C's apply.